The What: Yamaha Unified Communications (UC) has updated its CS-700 Video Sound with new features and is offering a lower price point. The What Else: "When we introduced the CS-700 two years ago, we incorporated the finest AV quality that's synonymous with the Yamaha name into a new all-in-one audio, video, and collaboration solution, which set a new benchmark in deployment, IT, and end-user experiences in these meeting spaces," said Mike Fitch, Yamaha UC's vice president of global sales and marketing. "Since that time, we've expanded the UC device with even more benefits, including a three-year warranty, enhanced camera performance, additional image settings, and now, affordability," he continued. 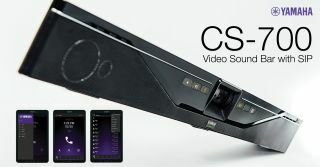 "As videoconferencing applications accelerate, a new price point of $799 MSRP for the AV model makes the CS-700 more accessible to a greater number of organizations and will align with Yamaha UC's new product development structure as we continue to broaden our portfolio of UC solutions." The Bottom Line: Designed for huddle rooms, the Yamaha CS-700 Video Sound Collaboration System delivers quality audio, video, and collaboration capabilities in a simple and smart wall-mounted unit that is easy to install and deploy, according to the company. In addition, the CS-700's integrated network management system allows IT staff to deploy and remotely manage each unit from one location, increasing service response and efficiency.